6. Configure your Internal and External Service URLs to point to mail.company.com. In this configuration, internal domain member clients find the SCP to make the connection to Autodiscover. External clients find Autodiscover.company.com using DNS to make the connection to Autodiscover. In both cases the clients are referred to mail.company.com for the actual Exchange Services. You will have received your certificate file from us, usually named your_domain_com.cer. Alternatively, you may have received it as several files: your_domain_com.crt and intermediate certificates UTNAddTrustServer_CA.crt and NetworkSolutions_CA.crt. The root certificate AddTrustExternalCARoot.crt may also be provided. 1. Open the Exchange Management Shell. This is done by clicking Start > Programs > Microsoft Exchange Server 2010 > Exchange Management Shell. 2. Type and run the following command. It should all be entered on a single line. Import-ExchangeCertificate -Path C:\your_domain_name-or-order_number.crt | Enable-ExchangeCertificate -Services "SMTP, IMAP, POP, IIS"
3. The certificate is now installed. 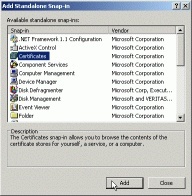 You may also need to follow the next steps to install the intermediate certificate(s) on the server. Note: If you use an ISA server in front of your Exchange server(s), you will need to export the certificate from Exchange onto the ISA server, and import. When doing so, you must be sure to include the whole certificate chain. 1. 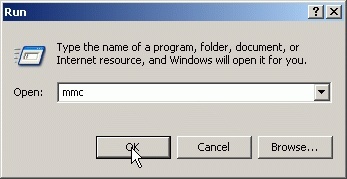 Click the Start menu, and choose Run. 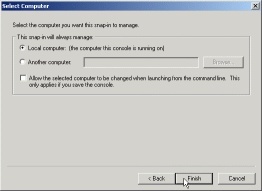 Enter the command mmc and click OK.
2. Click the File menu, and select the Add\Remove Snap-in option. 3. In the pop-up window, click the Add button. 4. Choose Certificates, then click the Add button. 5. Change the setting to Local Computer, then click Next. Note: This step is extremely important! 6. Choose Local Computer, then click Finish. 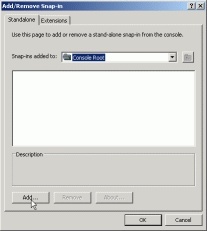 Click Close in the Add Standalone Snap-in window, then click OK in the remaining window. 7. On the left-hand side, expand the folder for Intermediate Certification Authorities. 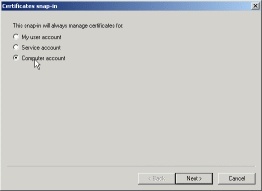 This will start the Certificate Import Wizard. Click Next. 8. When prompted to choose a file, select the UTNAddTrustServer_CA.crt file. Click Next, Next, then Finish to complete the wizard. 9. If required, repeat steps 7 and 8 with the NetworkSolutions_CA.crt.